Auto shut off valves use a small amount of pressure created by your float valve to shut off the water supply to your RO membrane. Follow these instructions to install an auto shut off valve on your RO system. First note the top and bottom of the shut off valve, the bottom has screws and the top has in/out marks. The red line exits from the last carbon block, enters the "in" on the top of the valve, exits through the "out" on the top of the valve and enters the RO membrane. 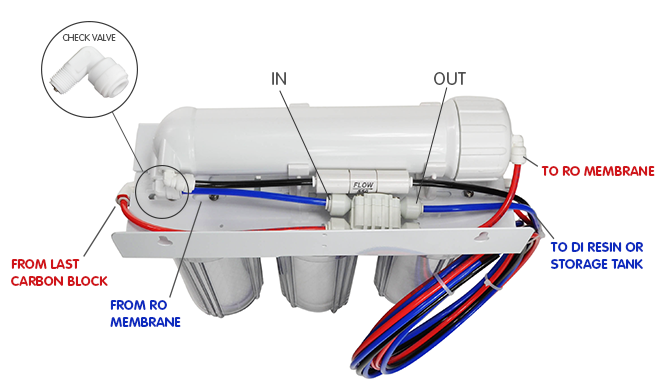 The blue line exits the RO membrane as filtered water, goes through the bottom of the valve to the DI resin or storage tank. The "in" and "out" portions are interchangeable for the blue line. To function properly the unit also requires a check valve on the filtered water end of the RO membrane. 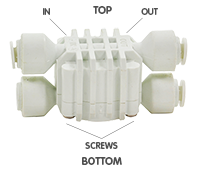 Many RO systems come with the check valve built in, check to see if yours has one. It will be inside the 90 degree hose fitting (pictured above) or may be an inline check valve (pictured right). If your system doesn't have one, both types can be purchased for a few dollars. They work equally well, however the inline unit is easier to install and replace.